I have two projects posted about making a Schwartzite tool chest. the first covered the shell and the second covered starting the interior. I drew up the plans based an article by Chris Schwartz about the rules regarding tool chests. The arguments made sense and his writing has always worked out well for me. Didn’t occur to me that maybe he was excerpting his book. Long story short I missed a little detail about battens so mine deviated a bit from his. First big difference was using poplar. Clear pine around here is $5.50 a bf; poplar is one third of that so poplar wins. A bit heavier but durable. I get most of the way through making the shell and on a lark I google “Anarchists Tool Chest” and lo and behold a cut list! What the hell is a batten? Maybe I should buy the book. Aha! thats what a batten is. A bit late for me, I had already glued on the skirts. Time for adaptation. Glued some blocks on bottom corners and attached the wheels. Now to get to my point. I’m going on vacation to Maine next week and all I wanted to do was finish the saw till and attach the drawer slips. The till came out perfect. 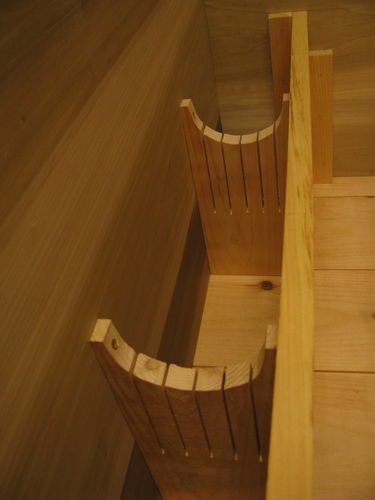 it hold five saws and there’s room for my dovetail saws. On too the drawer slips and…. Damn ran out of oak. Planing!!! I’ll finish when I get back. Also get to go to Liberty Tool and maybe Lie Neilson. rough life.